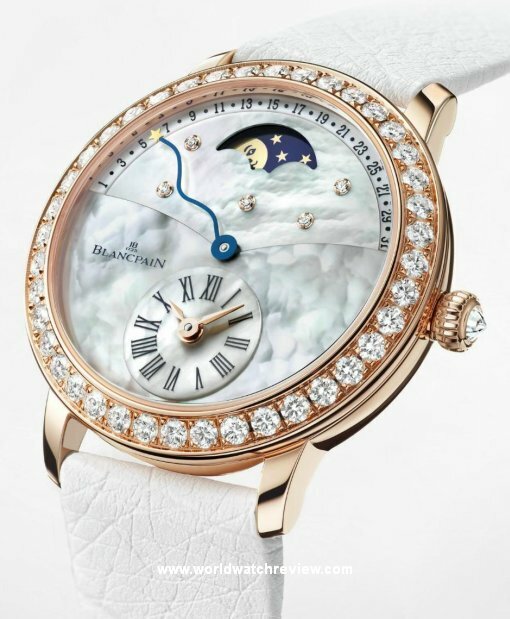 Compared to many timepieces offered today, this Blancpain Quantieme Retrograde (ref. 3653-2954-58b) ladies watch not only sports a brilliantly executed marquetry mother-of-pearl dial, but also comes equipped with a gorgeous retrograde calendar complication that shares the dial real estate with a traditional moonphase display. Conveniently placed at 12 o’clock, the indicator of moon phases is accompanied by five star-like diamonds that, to my knowledge, do not represent any actual constellation. The whole composition seems to be adequately balanced by the off-centered hour and minute indicator, which is placed at 6 hours and features a set of tiny rose gold hands pointing at bold Roman numerals. Although clearly created by an extremely skilled hand, the raised sub-dial leaves an impression of incompleteness. Perhaps, it could look better if it sported a hair-thin rose gold rim or something like that. As usual in this niche, the watch has its elegant rose gold bezel set with more than forty diamonds and also sports a finely cut diamond in its winding crown, which is not only exquisitely decorated, but also looks quite ergonomic. At 36 millimeters in diameter, the watch is on a larger side, but, thanks to a large dial opening, doesn’t look too massive. According to the Swiss brand’s press release, the new watch is to be powered by their Caliber 2650RL automatic movement that, besides featuring the usual Geneva Stripes pattern on its bridges, also sports a unique, flower-shaped oscillating weight, which is crafted from solid gold. The 65 hours of power reserve that this mechanism offers are more than adequate for a watch of this pedigree. Perhaps, the energy that this mechanism’s main spring is able to store is even excessive, since this is definitely not a daily beater and the watch will probably spend most of its life either in a safe or in a winder that will always keep the watch ready for every special occasion. So far, this is one of the finest complicated timepieces that will be offered to women around the world in the coming year. For a recommended price of $41,000 USD, this is a rather expensive piece of jewelry. On the other hand, given the amount of precious metals, diamonds and, what seems the most important, hundreds of hours of extremely skilled labor put into making each of these little beauties, the price tag seems to be well justified.